Honda took the winning design and performance of the popular Accord and transformed it into the fuel efficient 2014 Honda Accord Hybrid. With some of the Hybrid class’s best fuel economy, as well as a large list of standard features, it is a terrific option for drivers looking for a reliable and classy vehicle. Of course there are other midsize hybrid sedans on the market right now. The 2014 Toyota Camry Hybrid takes the automaker’s popular sedan and adds increased fuel efficiency. Which is the better buy if you’re looking for a fuel saver? When Honda engineers see a challenge, they attack it full force. In this case it was boosting the Accord’s fuel efficiency. 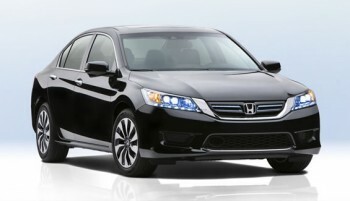 The 2014 Honda Accord Hybrid with CVT features an EPA estimated fuel economy rating of 50 mpg city and 45 mpg highway. * This is accomplished through a 2.0L four-cylinder paired with an electric motor. On the other hand, there’s the Camry Hybrid. It pales in comparison with a rating of 43 mpg city and 39 mpg highway. Sure, we love the Accord Hybrid because of its fuel economy and great list of standard features, but there are plenty more reasons to love it, too, such as its great handling ability. If you would like to take the 2014 Honda Accord Hybrid out for a test drive, we invite you to stop by Middletown Honda. Our dealership is located in Middletown at 520 Route 211, in a short drive from Mechanicstown and other OrangeCounty communities.